Sometimes I just love my life!! This past weekend I worked the red carpet for the PUSHING DAISIES screening at the New York Television Festival (much more to follow). In addition to talking to the show’s creator, Bryan Fuller (Heroes, Wonderfalls), I was lucky enough to get a little time with PUSHING DAISIES star, Lee Pace. I think you all know by know that Lee has made the short list of my top TV boyfriends. Just wait until you see the show and you will know exactly what I’m talking about. He’s beyond adorable, and I’m happy to report that he’s an all around nice guy (and did I mention a good hugger…oh yeah!). We got to chat a little this weekend and I now I’m even more smitten. It was hot as H-E-double hockey sticks on Saturday, so please forgive my appearance…just keep staring at Lee and enjoy!! Is he like 7 feet tall? I love a tall man! And you look adorable as always. Once again, jealous, jealous, jealous! Oh my gosh! You’re so lucky! He’s too cute! Aww you both look great! He’s so cute.. I can’t wait to see more episodes of “Pushing Daisies”! Oh, you too are making me green with envy. So happy you got hugs and one on one time. Wow, he looks tall! You guys both look cute. I can’t wait to see the premiere! All of this buzz (mostly here at gmmr) has made me really interested in seeing Pushing Daisies. So consider your job done on my part. You are too kind. It was so hot out all weekend, despite changing my clothes, I still felt like a sweat mess!! Oh, am I loving this or what! My favorite TV blogger and my new TV crush? Fabulous- you look great, and so does he 🙂 I’ve seen a bunch of people say this, and I’d like to say it too- you’re enthusiasm for Pushing Daisies has made me look forward to it so much, it’s topping my “gotta see” list for this fall. Congratulations on getting me on the Daisies bandwagon! 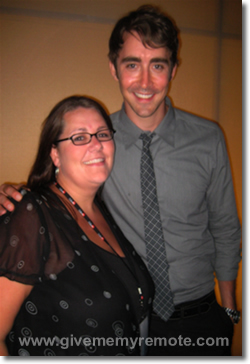 I love me some Lee Pace, and I have since he played Aaron on Wonderfalls. I am so excited that he and half of the Wonderfalls creative team have teamed up again for what looks like an amazing show. I can’t wait until October! Whoa! HE’s the lead in this show? I just watched Wonderfalls this summer and have crushed on him ever since having a very nice romantic dream about him. I did not, however, realize that he had his own show this season! Whoo hoo! So watching it!